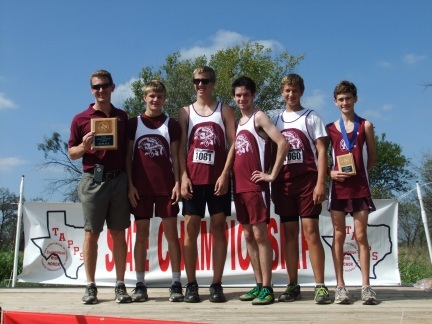 The Regents Academy boys Cross Country team excelled at the TAPPS championships at Waco on October 25. Senior Will Young won the state championship by finishing in first place while junior Aaron Bertke finished fourth. The team, with Caleb Henry, Jake and Luke Higginbotham, and Wesley Young, finished third in the team competition. Congratulations, Eagles! Congratulations to the Regents high school boys Cross Country team. 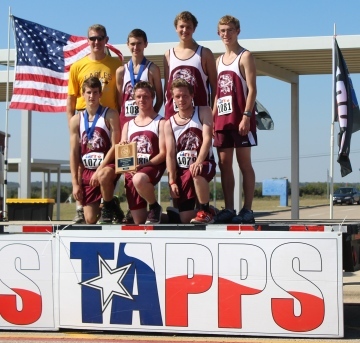 The team won 4th place honors at the TAPPS State Championship Meet at Baylor University. 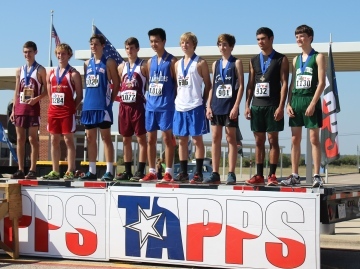 Special congratulations to Regents sophomore Will Young, who placed 1st in the 1A division. State champ! Woo woo! Many thanks to our fantastic Cross Country coach, Dr. Tim Young, who is pictured below with the team: Sam Alders, Tim Marshall, Aaron Bryant, Caleb Henry, and Will Young. 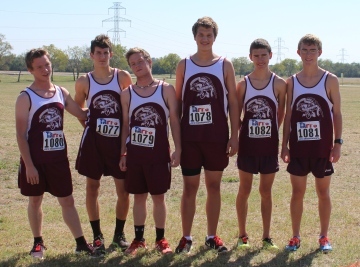 Thanks to Mrs. April Hoyle for making this video, and great job, Regents Cross Country Team!